HUST was disappointed with the turnout at yesterday's 'Family Event' which was held at Shobdon Aerodrome. 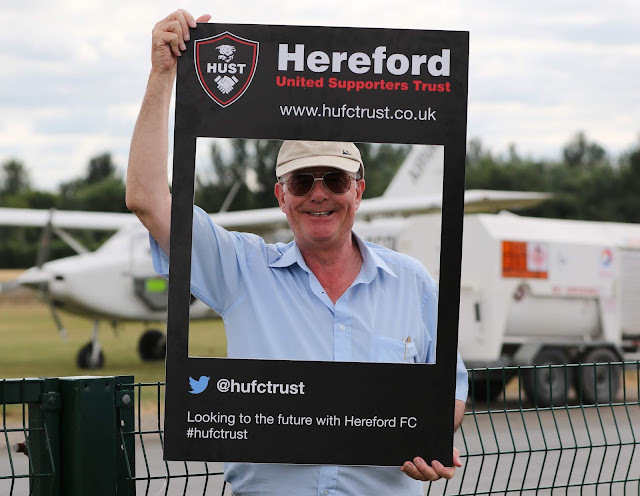 Given the event had been given advance publicity by, amidst others, Bulls News and the Hereford Times and was mentioned several times during Saturday's friendly at Edgar Street, officials were left questioning what they had to do to attract more interest. Obviously the event needed to take place at Shobdon because of the Skydive. And HUST officials had worked very hard to get support which meant that almost all the money they took would go to purchasing more shares in Hereford FC. But the numbers attending fell well short of what had been hoped for. Meanwhile in the battle of the HUST beers which visitors could sample at the event, beer B was deemed to be the favourite. Brewed by the Swan Brewery in Leominster, it will go on sale under the HUST banner in a few weeks time at selected outlets.